After three months and 13 days, football finally returned to the great state of Ohio. Well, sort of. The annual scrimmage in Ohio Stadium usually offers a preview of what's to come during fall Saturdays in Columbus, but this year's Scarlet and Gray game felt an even further departure than normal from a typical game day. Sure, Urban Meyer was nowhere to be found for the first time in eight years, but the game itself lacked a certain flair with defenders unable to tackle ball-carriers, turning the exhibition into a game of glorified two-hand touch. While Ryan Day may have seemed calm and content following his 15th "practice" since officially succeeding Meyer, many fans wondered just what they'd witnessed for two hours inside the Horseshoe. With 11 starting jobs to be filled and half the coaching staff turned over from 2018, plenty of questions remain for a team with expectations that remain in the stratosphere. Though we won't know much about who this team truly is until August 31 when Lane Kiffin's Florida Atlantic Owls come to town, the 2019 Ohio State spring game did offer at least a handful of clues. For over a decade, Buckeye fans watched their quarterback successfully pull the ball from the gut of a running back before scampering outside for big yards. Terrelle Pryor may have been the first such player to run the zone-read in the late 2000s, but Braxton Miller and J.T. Barrett followed suit with great fanfare in the years that followed. While fans eventually tired of the manner in which Barrett efficiently carried the offense as a runner, the lack of such a weapon became evident in the middle of last season when the Buckeyes struggled to run the ball in short yardage and red zone situations. While Dwayne Haskins proved to be an upgrade over Barrett as a passer, in this particular area he fell short. Though Day is adamant that Justin Fields has yet to earn the starting job over fellow redshirt freshman Matthew Baldwin, the likelihood of someone else besides the Georgia transfer taking the first snap would be a major surprise. While he showed that he's still raw as a passer, completing just 4-13 attempts on Saturday, Fields displayed an athleticism not seen from the position since Miller was under center. The Buckeyes called a number of tight zone run variations in the spring game, but it was hard to determine their effectiveness given the no-tackling rule. However, Fields picked up 52 yards as a runner in the game (not counting sacks) thanks largely to his ability to read an unblocked defender and beat him around the edge. Once near the goal line, it was clear that Day and his offensive staff had planned to utilize this ability, overloading the defense into the boundary by lining up all four receivers to that side. After taking the snap, Fields simply read the unblocked end who crashed down to play the running back, not realizing the tight end (Y) was looping around him to act as a lead blocker for the QB and turning the play into a simple foot race to the pylon. 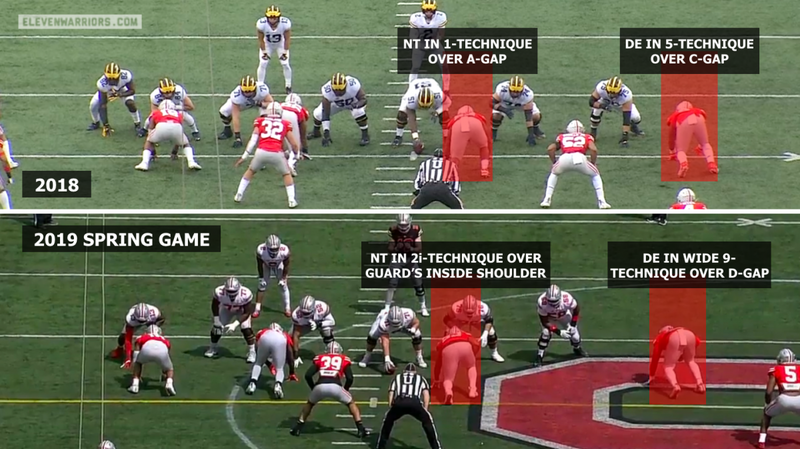 Though it was unclear just how effective the tight zone run truly was in this game, it was quite evident that the Buckeyes' gap schemes gashed Greg Mattison's defense over and over throughout the afternoon. In particular, the Counter scheme, which pulls the center and tight end back around the weak side of the formation and pinned the aggressive OSU defensive ends inside, proved to be the most potent ground scheme for both the scarlet and gray squads. One major reason it was difficult to determine the efficacy of the tight zone runs was because of a slight change made by Mattison in the way his defensive front sets its alignment. Though still a 4-man (or Even) front, the placement of the wide side defenders differs slightly from years past, with the goal being to slow down offenses just like the one they practice against each day. Most 4-man fronts align the same way: on one side is a tackle in a 3-technique over the B-gap between the offensive guard and tackle with a defensive end to the same side aligned directly over the tight end in a 6-technique. On the other side, the nose tackle is often in a 1-technique over the opposite A-gap splitting the center and guard while the end to that side lines up in a 5-technique outside the tackle. 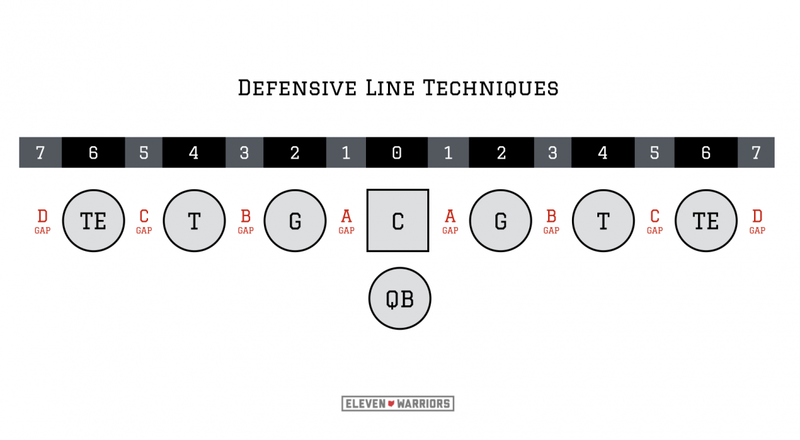 With this in mind, many offensive coaches use these gapped looks against the defense, teaching their blockers how to execute combination blocks that effectively take out the tackles before one blocker drops off to take on a linebacker at the next level. Such blocks are the critical component to the Buckeyes' own tight zone run and are elemental to the play's success. Instead of trying to shoot the gap in between that double-team, as had been the style under previous coordinator Greg Schiano, Mattison tries to make those battles more of a one-on-one. With the nose tackle placed in a "2i" alignment over the inside shoulder of the guard, he is able to blow the guard backward and throw off the footwork of the center, disrupting the double-team block entirely. Even if the tackle isn't making a play on the ball, his effort should free up the linebacker behind him to mirror the runner without the threat of a blocker reaching the second level. With the nose widened just a hair in Mattison's scheme, the end to that side loosened up his alignment a great deal, adding a full gap between himself and the offensive tackle in what's called a "wide 9" technique. While Schiano's game plans sometimes seemed to lack a connection between his unit's coverages and fronts, Mattison has married the two elements of his defense by widening the end's alignment to better allow him to act as the edge defender against the run, tasked with turning plays back inside to the flowing linebackers. "We're multiple to a degree," Hafley told the media following a practice back in March. "We're not just going to line up and play the same thing every time, run the same blitz every time." Buckeye fans have long welcomed a diversified approach to coverage techniques after Schiano's reliance on man-coverage failed to slow down spread offenses like Purdue and Maryland last fall. But as both sides lined up in the spring game, fans still saw plenty of man schemes in the secondary. Both from base and nickel packages, the OSU defense shadowed receivers one-on-one with a deep safety in the middle of the field. While Schiano's schemes came with all kinds of checks that asked defenders to adjust on the fly to the offense's alignments or movement, the current system is much simpler. "We're putting some stuff in, but our goal is not to get complicated with scheme," Hafley added in March. "We want our guys to learn to basics, to build a foundation, to play fast, to understand what they're doing with great fundamentals and technique, and then we'll go back and watch the film and in training camp if we feel like we need to have more we'll add more." That lack of complexity allowed players like Amir Riep to succeed in chasing quick receivers like Jaelen Gill around the field and coming away with an interception in the second quarter. The scheme that set up the pick is nothing exotic, sending the middle linebacker through the B-gap with the secondary playing Cover-1. The scheme was a week-one install for Mattison when he was the coordinator in Ann Arbor, and the call appears to hold the same priority today in Columbus. But while Ohio State defense appeared to rely on man-coverage on first downs, they quickly transitioned to two-deep, pattern-match coverage schemes on second and third down passing situations. As he eluded to in his clinic speeches at both the OHSFCA and Ohio State coaches clinics, Hafley's secondary ran a mix of Cover-4 (Quarters) and Cover-6 (Quarter-Quarter-Half) schemes that marry zone concepts with man-coverage techniques. When the offense lined up in 3x1 or empty sets, Hafley called for split-field coverage with defenders on one side working together. However, while programs like TCU or Alabama install countless coverage variations to handle these scenarios, the Buckeyes kept things relatively simple. Though the concept names might seem different and somewhat confusing, the defense essentially mirrored their coverage on both sides of the field with one exception - the cornerback playing the #1 receiver to the wide side. While the corner was locked up in man-coverage, the remaining three defenders to that side played a 3-over-2 pattern-match technique in which they read the movements of the inside receiver, known as Palms (or 2-read). On the opposite side, the three defenders did the exact same thing, playing 3-over-2 and reading the inside receiver as well. While the example above resulted in a great play by Jahsen Wint to break on the ball and intercept Baldwin's pass, the bigger picture reveals what Hafley had stressed throughout spring practice. Instead of turning individual members of his secondary into specialists capable of playing only one spot, he's teaching them how to master techniques that can be applied to numerous situations. Reading the inside receiver in match coverage isn't just a third down gimmick against empty sets, but something that could very be played on 1st & 10 if the game plan so dictates. "I want to teach these guys how to play the game," Hafley told the media in March. "I don't want them to be just pigeon-holed into one position. I want them to play football and learn how to play different positions because I think it will help us, and I think it will help them in the future."